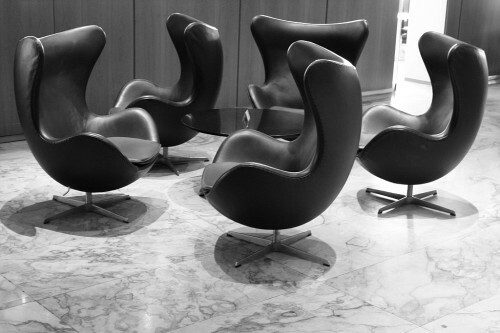 The Arne Jacobsen Egg Chair is probably one of the most famous chairs ever designed during the Mid-Century. It takes its name from the similarity with a broken eggshell and because of its ‘wrapping’ shape it’s considered the modern version of the Georgian wing armchair. As I already wrote in Arne Jacobsen: Airplanes, Swans and Eggs, Arne Jacobsen designed the Egg chair for the lobby and the guest rooms of the SAS Royal Hotel in Copenhagen to provide a warm and intimate welcome to the customers: and being part of the interiors of the first design Hotel in the world helped for sure the chair to become one of the design icon of the twentieth Century. The Arne Jacobsen Design Approach. The revolutionary moulding process developed by the Norwegian designer Henry Klein -that allowed him to create furniture from shaped plastic shells- was probably chose by Arne Jacobsen to obtain the peculiar shape of the chair. This technology was used under license by the Egg Chair’s manufacturer Fritz Hansen and then is highly probable that Arne Jacobsen knew already about it during the design process. Thanks to this special technique, Arne Jacobsen could design/realize a one piece only frame including the armrest. The particular shape of the frame requires a meticulous and skilled hand-tailoring work to fix the cover to it and this means that only six or seven chairs a week can be produced, even today. The Egg Chair is one of the most iconic Mid-Century chair, inspired many other chairs afterwards and after more than fifty years, it still looks a contemporary/futuristic chair. Check the Resources Page for more iconic mid century furniture. If you found this article interesting, don’t forget that you could discover much more about mid-century joining the completely free and spam-proof Mid Century Home mailing list, now! You will receive only a weekly email with exclusive content that I don’t publish on the blog.